This week has been a roller-coaster of emotions for Team Spring. But, with tremendous support from the Design Factory family and our great team dynamics, we pulled through the week surprisingly well. 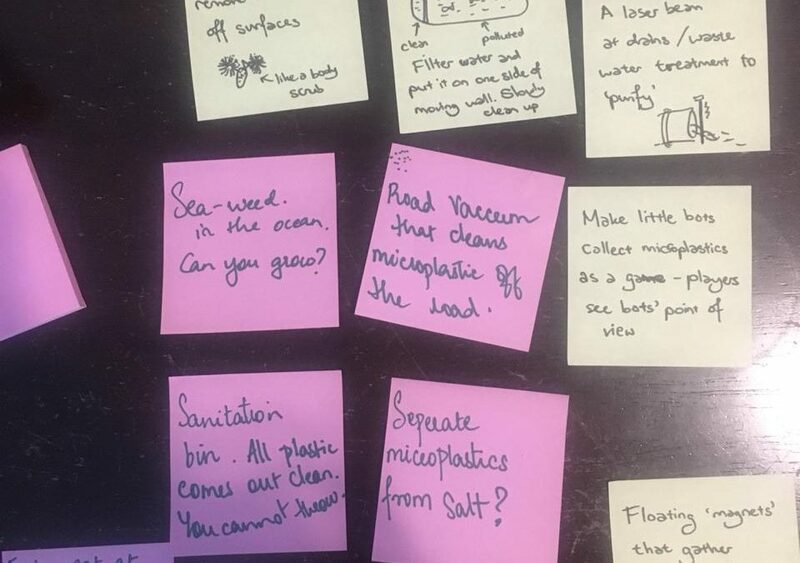 Beginning the week with a team swop with our peers from the SUGAR and ME310 program, we challenged them to come up with concepts that would help solve our microplastics issue. We gave the team addressing our problem – ‘How Might We’ reduce clean up microplastic pollution either in our bodies or in the environment. The team came up with the idea of a motion-powered system (using car traffic) to power filters underneath the drain system that will clean out microplastics and release clean water into the stormwater drains. It was interesting to see our peers come up with fresh ideas that opened us to a possible newer concepts. Our peers demonstrating their idea of catching microplastics via motion sensors. In a very insightful class from our mentor and friend Paris, we learnt about eco-design and circular economy. We learnt the concept of cradle to cradle which means taking into account the entire life cycle of a product, including optimizing the product’s recyclable and renewable possibilities. Using this circular economy as a key to a product’s making, we used it to find gaps in our team swop concepts. This class on circular economy would help us think of weaknesses and flaws from an eco-design perspective – including material, consequences, unnecessary use of resources and social impacts. Jing joining us on Skype for our weekly class. She is currently in Malaysia enjoying herself. We revisited the PESTLE framework and we realised we need more research to have a better foundation. We would be looking for good tools/methods to ideate /focus problem/ as we need to generate fresher concepts and solutions. Need to keep circular economy and eco-design in mind before coming up with a solution. For this, we need to understand the whole lifecycle of plastic. Great progress Team Spring and glad the eco-design lecture was helpful! With next steps, as previously discussed, really try to focus on time-blocking your ideation sessions so that you can develop more solutions and ideas and receive more feedback. Well done!